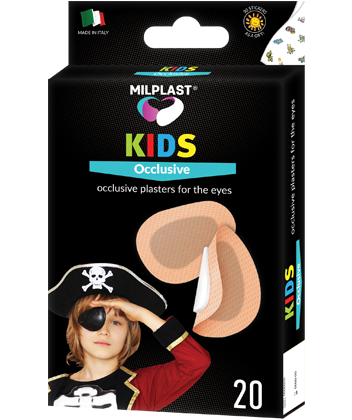 Milplast KIDS Occlusive is used in children's ophthalmic practice as an occlusive dressing for vision correction (occlusion treatment - eye closure). The plaster absorbs the secretions, protects against dust, dirt and light rays. The set also comes with cheerful stickers to raise the mood of a small patient. - Black polyurethane with white PE base. 2. Take the plaster out of the wrapping and remove the protective part. Remove the sheets protecting the adhesive surfaces, and position the eye-patch so that the pad is correctly positioned over the eye. 3. Change the medication when you need it. Use in ophthalmic practice as an occlusive dressing.